There've been a few celebrities on this blog, and although we enjoy them, my real heroes are more obscure - the preservers of architecture, the documentarians of the blue highways, and people like Mike Babick, conservator of the that which was once ubiquitous and is now precious. We visited Babick last year at his home in Prairie Village, Kansas, near Kansas City, and shot lots of stills. This year we returned and shot small digital movies on a Sony DSC-H2. What does Babick preserve? 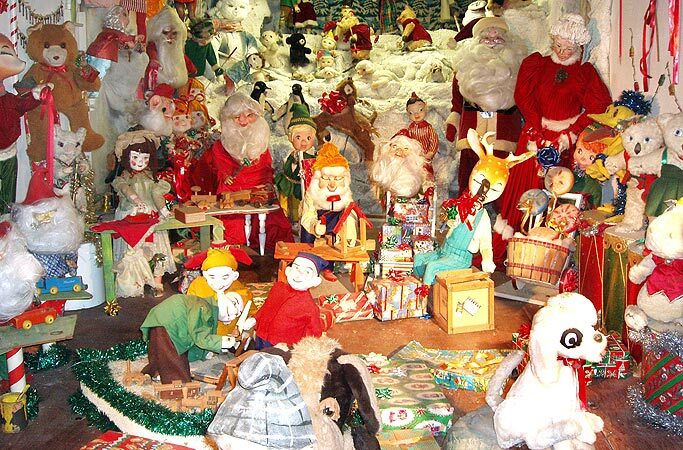 Christmas automations - lots of them. My movies are pretty low-res, but I've see lots of these automations broken in flea markets over the years so I thought it might be nice to show the range of motion of working models. 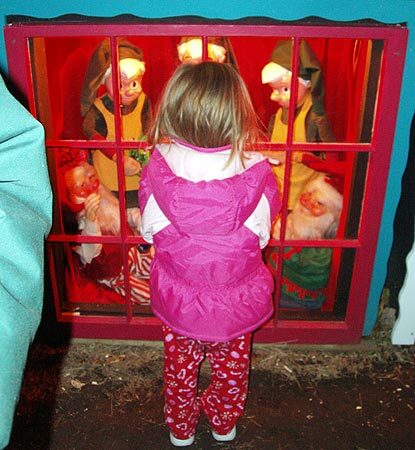 Here, in a slightly spooky display, Santa and Rudolph lean out a window like popes greeting the awaiting crowd. 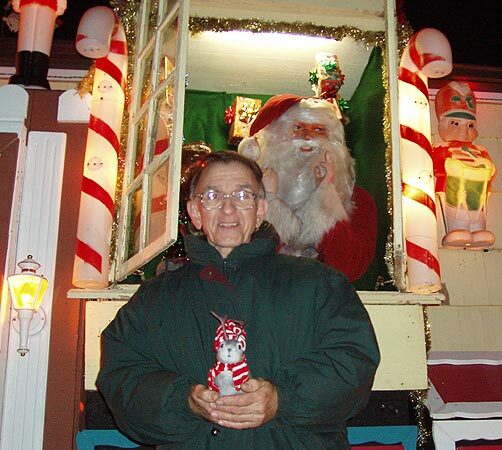 Outside, lots of people wait every night of the Christmas season to see the "Falmouth house" as some call it, for the street on which Babick lives. 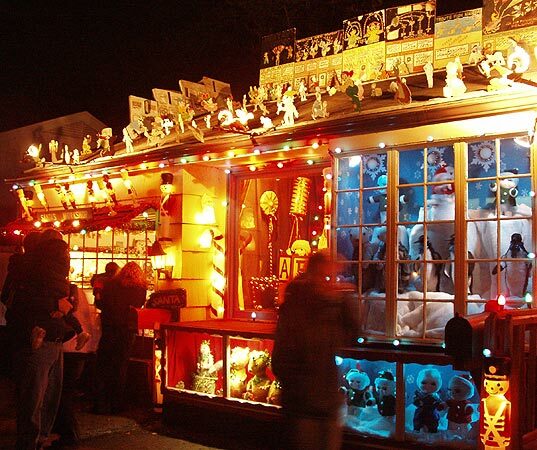 This year, Babick added spinning candy near the roof-line. Lines of cut-out figures inhabit the roof. The window displays change from time to time. All of which are oriented. 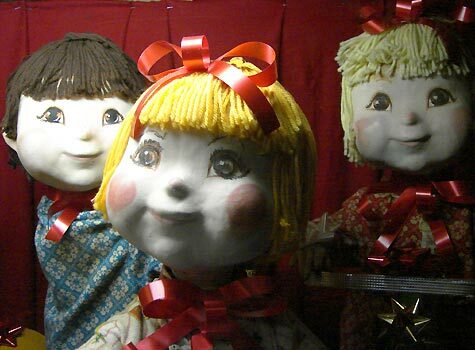 Most, if not all, of the automations were made for display windows in department stores. 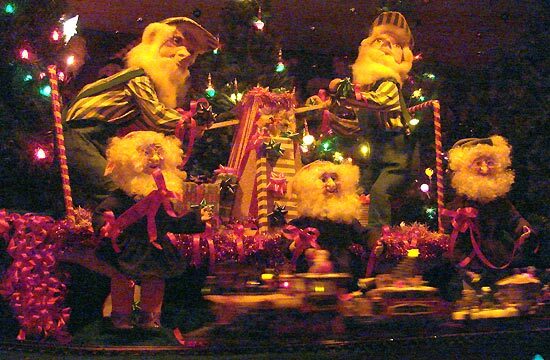 Elves work in Babick's living room window as a model train goes by. A group of gingerbread men dance in another window. Dolls do whatever it is that dolls do. 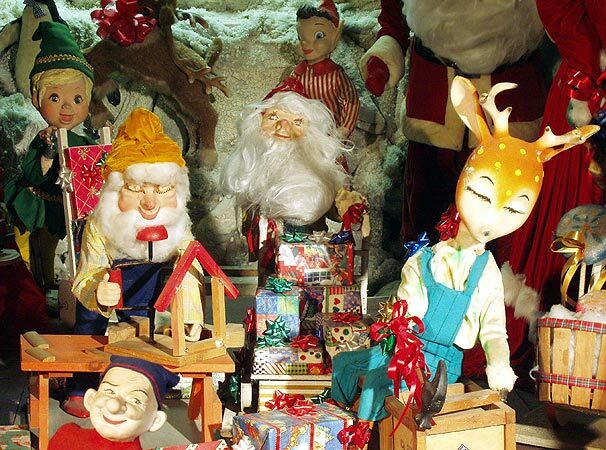 Babick's magnum opus is in his garage, where dozens of old Christmas window display automations work in a cacophony of motion. He keeps the garage door up so you can see everything. Here's a pan view so you can see more of the garage interior. Santa and Mrs. Clause preside. 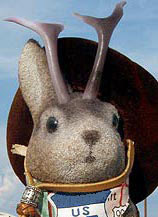 A bipedal reindeer hammers away as elves work in the background. 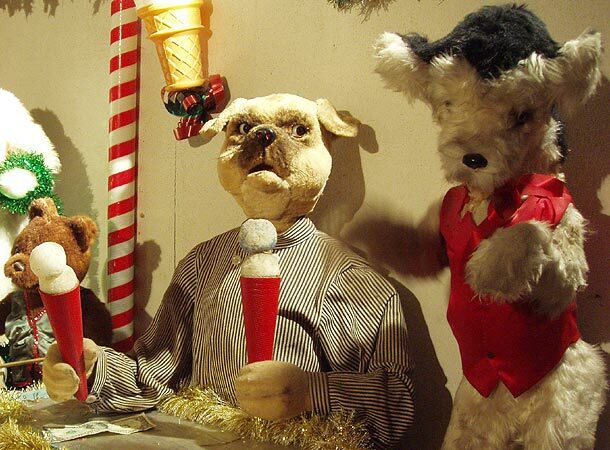 This canine ice cream vender is my favorite automation in the whole place. Check out the motion in his eyes. 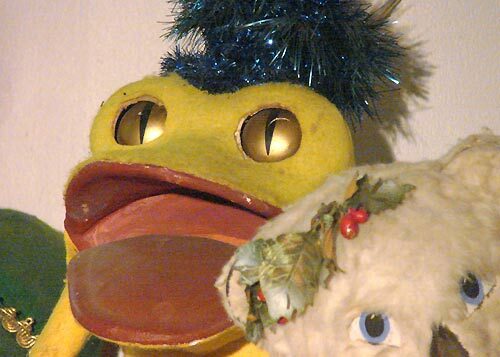 My second favorite is this frog. 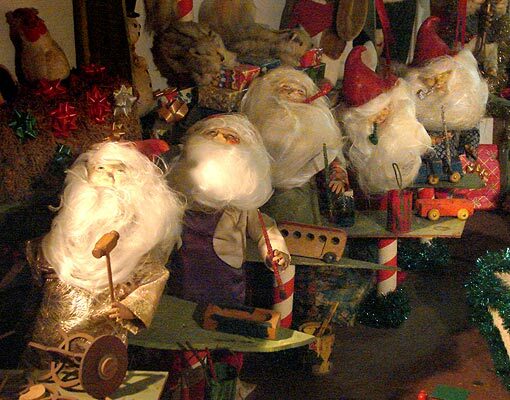 A group of elves with spun Fiberglas beards lines the wall. Sometimes the range of motion in not all that sweeping. Most of the smaller pieces would have been displayed in groups, which increased their appeal. To the left of Babick's garage, the mood changes from secular to religious. 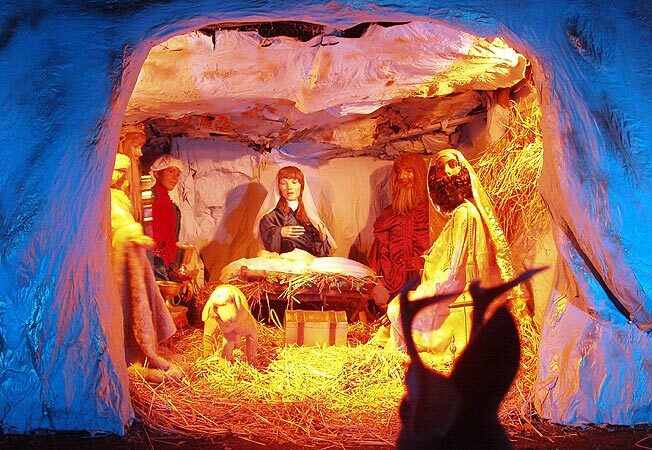 Blue lighting serves to set apart this life-size manger scene. Each of the pieces moves very slowly, but they work well together. 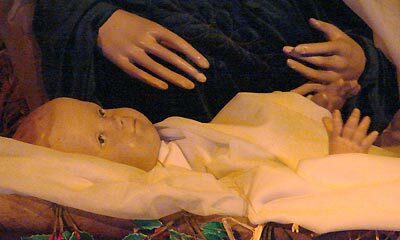 My girlfriend thinks the baby Jesus looks a bit like Bobby Hill from the animated show, "King of the Hill." I had uploaded a movie of it to You Tube and mentioned the Bobby Hill description - and You Tube removed it; I wonder if the description was flagged by copyright violation protection software. I wonder what the neighbors think of all the traffic. A mixed reaction in such a crowded neighborhood, I would presume. 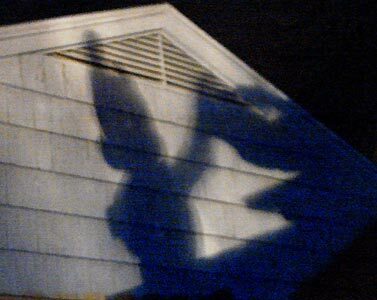 Here's a shadow from Babick's roof, falling across a neighbor's house. For the benefit of those interested in these things, I'll finish with a few more brief movies form the garage. Have a fine Christmas Eve! Elves work while a girl irons. This spinning bear has had quite a few You Tube hits. I suppose people search for "Christmas" and "bear." I think this elf is a little spooky. A wall is lined with automated critters. Interesting post. Brings back childhood memories of Christmas shopping when there were department stores downtown. The lamb kicks like it had been in the Rockettes. Do you know if he packs all this away after Christmas? Does he so actual restoration work on the pieces? This post is amazing! I loved all the vid clips of the animation so I could watch them with my children. There is an amazing restaurant downtown Greensburg, KS that every year at christmas they purchase a new animation type display and add it to their collection. The entire restaurant from top to bottom (and yes they even have a top floor they decorate and allow guests to look around) is decorated with its own animation theme. It's spectacular! Angel, now I have another reason to go back to Greensburg. How could such a small town have so much cool stuff?..the Big Well, the Rexall soda fountain and the restaurant you speak of. I'll eventually get around to blogging pics from the first two; I shot them ages ago, but they fall into my "whenever" catagory and I keep thinking I'll need some evergreen stuff like that for periods when I stop traveling, which I never seem to do. Toltec; yes, he does restoration on the pieces. I'll know more when I interview him, which I wasn't able to do this season. There isn't a lot of info online about old automation manufacturers and I hope to change that. I just found this article, awesome! 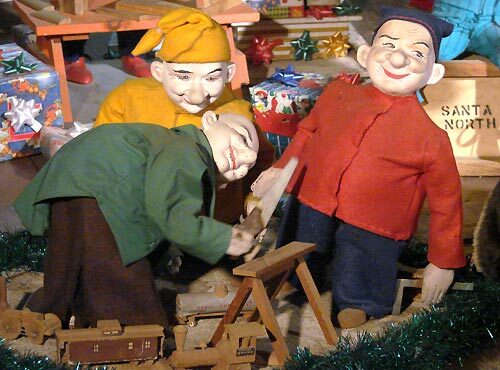 I have some old David Hamberger figures that still work and I display in my shop window at Christmas. I am trying to add to my collection. I just happened upon these in a store going out of business. Other than that I haven't seen any around in a long time. Where do most collectors find these animated figures? They are found, for the most part, where any other antiques are - flea markets, estate sales, etc. You might also check fixture auctions of old stores.